Guess it will be some betting company like Williams Hill or something. Paddy Lowe: "The regulations are very restrictive. I hope it's the case for everybody else, but we're struggling to find a lot of performance out of these front wings." Williams Hill Mercedes would sound nice tho. Change back to a Rothmans like livery and Ill have all mushy feelings. Anywho, Sofina isnt very obvious to me. Lavazza would be the better Obvious one in my book. Lavazza is a prominent sponsor in motor racing and has been in GP2/F2 since a couple of years. Would be a logical step up to become a more prominent sponsor in F1. Since Lavazza is Latifi's personal sponsor since 2016 and the fact that Lavazza is stepping up with their advertising campaigns like the collaborations with Arsenal and Liverpool in the Premier League, I think Lavazza is going to be our new sponsor. Lavazza has sponsored in F1 very prominently during the past at March and us via Leila Lombardi. Edited 2 time(s). Last edit at 03/01/2019 12:05 by AlanJones. I suppose having a british driver the surprising sponsor will be a company from Great Britain. Is that a minor deal or a major one?? Like BT who suddenly is going to be our main sponsor? Or Sky? Or have you got any other ideas? I am a bit worried about Williams chances of getting new big sponsors because they came dead last in 2018 and because of this they did not get much air time. Would new big sponsors throw money at Williams with the chance they will get very little air time in return? 2013 to 2014 a good example. Yes, I agree. Might also include some sort of black based colour scheme which might look mean. Sky would make sense and has several native markets. Plus they have the clout to turn the team around. It's kind of a dream scenario as it would be in their interests to have their cars near the front. Maybe a dream too far. 1) Toto Wolff had just left Williams and could be believed to have a soft spot for the team and may have given indications that the Mercedes engine was far ahead of the competition, as it turned out to be. 2) Williams believed in themselves and were taking out big loans secured against their land, factories, wind tunnels and other assets, including WAE intellectual property. These loans are still not yet repaid. Making new sponsorship deals has more to do with prospects of a team and how they are meant to do in near future rather than their current form. Making new deals with new technical staff, new engine deal or new drivers can bring in interest or else you should be winning races. That's why we were good for making good deals with new sponsors after a terrible 2006 season or 2013. 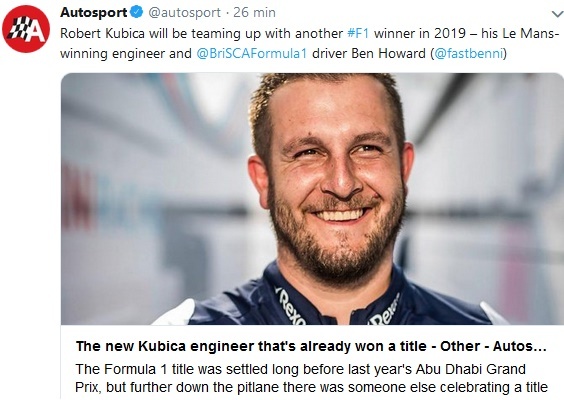 We threw away such a chance at the end of last season with wasting space with pay drivers sponsors when there were alot of talks of what Williams can be in hands of Paddy Lowe and Debeer. Dare I say it? Yes I dare to say it. Sky would fit Woking very well if Im honest. And there are a gazillion reasons why Sky would opt for Woking rather than us. 2) You are bringing up these loans often. Any news on when they are or will be repaid? Any indication on the load it bears upon our budget? 1) It is not only that debt repayments take money out of the current year's budget, they in effect say to a sponsor give us $x million and we will give it to the bank and it will not be used to develop the car. Interest rates are so low at the moment interest costs seem be about the same as a car having big smash into the barriers. 2) If income drops unexpectedly then covenants that were originally thought of as liveable with suddenly become onerous. If these covenants are violated then debts may become immediately repayable, which of course they can't be. 3) If you already have used up what others would regard as your safe debt capacity, you will not be able to say "lets get a new supercomputer on finance" or "lets borrow a few million to do some original research on CFD, batteries etc". As mentioned elsewhere the CFD rules have changed for 2019 and now permit unlimited use. A loan facility of £10,000,000 repayable in eight instalments over a four year term. These instalments are £500,000 on 30 April 2018 and every six months thereafter until 30 April 2021, with all outstanding sums repaid in full on 31 October 2021. This facility carries interest at 2.4% over LIBOR. A loan facility of £3,144,000 repayable in thirty-one instalments over a three year term. These instalments are interest and capital repayments of £107,000 on 2 January 2018 and then on 31 January 2018 and every month thereafter, with all outstanding sums repaid in full on 30 June 2020. A revolving credit facility of £10,000,000 to be made available throughout the period ending 31 October 2021.This facility carries interest at 2.4% over LIBOR. An overdraft facility of £5,000,000. This facility carries interest at 2.4% over the Bank of England Base Rate. So Williams went into 2018 with just over £20million of debt due in various chunks up to the end of 2021 and a 2017 EBITDA of about £10million. Ratios of EBITDA to debt of over 4 are considered dangerous, so the 2017 numbers are fine at about 2. But is also pretty easy to see that only a small drop in income, such as the difference in constructor's prize money from 5th to 10th makes this ratio increase to unacceptable levels. If the internet figures are right the loss in constructors prize money is about £15million. In the first half of 2018 Williams repaid about £14million wow, but took on another £10million reducing overall debt by £4 million. and the final repayment in September 2018. A revolving credit facility of £10,000,000 to be made available until September 2018. An overdraft facility of £5,000,000 to be made available until April 2016. A term loan facility of £11,000,000 repayable in December 2016.
credit agreement and the final repayment due in June 2020. Remember that the current debts are after the sale of £10million worth of land, over £5million from the sale of rights for the flywheel system to GKN and some reasonable sponsorship and constructor's revenue. You can see from this that the debt from 2014 is not really being repaid, just put back to a later date. If 2021 results in a much more equal constructors prize fund then these numbers are manageable. With Red Bull possibly threatening to leave, Merc and Ferrari having a lot to lose I wouldn't bet too much on the new system being as equal as it could be, remembering that Williams will lose their £10million bonus. So if Williams end up 10th in 2019 then I can seriously see the possibility of interest costs sky-rocking and or the team being forced to sell and lease back their property to repay loans. This would of course be a forced sale so full market value may not be reached. These are course all public numbers and will have been gone over far more thoroughly by potential sponsors. Sky might not blink at them, Rich Energy may be more likely to do so. Edited 2 time(s). Last edit at 04/01/2019 11:33 by IanSmithISA. Debt can be re-financed though Ian. The 'repayment date' is kind of not the point. It's what the rate is at that point. I am slightly disturbed to see loans based on LIBOR. Even I can get finance on BOE + rates and I am small fry. I agree, it can but only so often, most of the current debt is 2014 debt refinanced, rescheduled and rescheduled again. Being overly glib on debt is how companies in the UK like Carillion, Interserve, Kier etc got into so much difficulty. The lenders stand to lose so much that they won't say no, until one day the lenders do said "No". Currently interest seems to be pretty low at around £300,000 per year, that's one spectacular crash. What is more worrying is what loan covenants exist, a £15million drop in constructors prize money would suggest that any that are based on income or earnings may be in danger of being breached, unless sponsorship can be increased. This is not a theoretical point, if this occurs lenders will give very serious consideration to immediate loan recall, generally covenants are established on the basis that if they are breached then not getting the loan repaid is looking likely anyway. Williams seems to be safe in that even a fire sale would probably pay of debt, but it would leave the team owning little, running a mid/rear of the field car and with no advantages over the factory teams and the factory supported teams. Had Williams gone for a Honda engine deal it would easy to see how debt would have disappeared very quickly and even thought the short term results may not have been great the future would have looked more secure. Edited 1 time(s). Last edit at 04/01/2019 16:34 by IanSmithISA. Yes, the Honda deal would have made a lot of sense. I think SFW may have refused to work with them though. Who knows if we pursued it or not. From a purely financial point of view, a works engine deal similar to Mclaren's would have been a spectacular coup for the team and we now know that the engine is not as bad as Mclaren made it out to be. I have to agree Ozzy that financially it would have been the way to go, but Honda has yet to sort basic issues out (see linked article) and with Williams record of not producing front running chassis, from a purely performance point of view Honda was a big gamble at the end of 2017. Obviously though no one expected Williams to bomb out like we did in 2018. In hindsight, having Honda last year would have been a silver lining... But hindsight is always 20/20. And the terrible effect of pulling support from Williams and going to McLaren all those decades ago will not have been forgotten by Sir Frank. So chances of Williams EVER having a Honda in the rear of our cars is very low whilst Sir Frank is alive. Edited 2 time(s). Last edit at 06/01/2019 04:01 by Mr Brooksy. I really hope that both Ozzy Osborne and Mr Brooksy are wrong and that Sir Frank did not block any possible opportunities with Honda if there were any. If the stories are true and Honda pulled out as a result of Sir Frank's crash and left Williams with no engine and ending up with a Judd then it would be easy to understand why. That both of you would suggest such a thing is interesting as Williams are a hybrid company partly Sir Frank's, partly public company. Whilst the arithmetic gives Sir Frank control, I can't see how those in control of the public part could possibly allow Sir Frank to make such a decision without a massive stink. I appreciate that I may appear a bit negative about Williams' prospects but we mustn't forget that Force India went under this year and although it is tempting to say Williams is a much stronger business with a greater history this is probably an illusion. Although WAE is profitable, it is not profitable to the extent that it can contribute much to the F1 team and it is unclear how much it costs the F1 team to support WAE. Apart from this the F1 team doesn't have any other extra sources of funds compared to FI except of course the "unfair" £10 million Historic Team bonus that Claire wants to lose in exchange for a "fairer" overall distribution. I agree that the drop to 10th wasn't expected and McLaren were successful in passing much of the blame for their recent performance onto Honda. It also seems that many including me who were supportive of a Honda engine accepted that the engine was currently not as good as the Merc/Ferrari. It is also easy to see that the appointment of Paddy was going to lead to a much better car and it still may do so and anyway dropping from 5th to 6th wouldn't have been much of a loss. Its the "curve" that worries me, since the departure of BMW every step forward has been followed by a bigger step backward. Williams finished 2018 last, with debt and are probably now in the worst position in the short term of any F1 team. Haas, Sauber and Toro Rosso will probably be running cars heavily based on Ferrari, Ferrari and Red Bull designs and they are all looking comfortably funded with Haas Automation, Red Bull and Alfa money. Even Force India with Stroll money and an unclear ambition and McLaren who are struggling with performance and I can see leaving F1 are in better short term positions. So we are left asking the question of where is the vision for the future of the team coming from? BIG NEWS.....Ferrari let Arrivabene go.